BOSE Home Speaker 500 goes official with LCD display, Its first Alexa-enabled smart speaker. Today, Bose launches a new wireless smart speaker - the Bose Home Speaker 500. 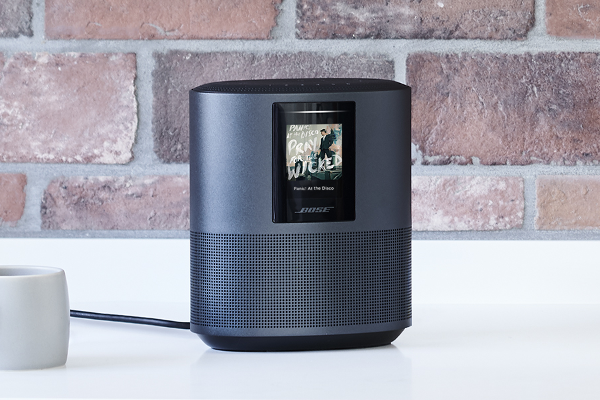 With Bluetooth, Wi-Fi, and Alexa built-in, it delivers instant, easy access to millions of songs and tens of thousands of skills for information, entertainment, smart home control, and more. The LCD display on the Home Speaker 500 shows information about the content currently playing on the speaker, including album art, track name, artist name, music service information, radio station name, and location, etc. There is an optional clock setting available in the Bose Music app, which displays the time when the speaker is in standby mode. The display also shows setup and diagnostic information. It does not play video content and is not a touch screen. It will automatically dim based on the brightness of the room, and will turn off if content is not playing. The new Bose Home Speaker uses advanced Bose microphone technology developed over years of research for Bose commercial headsets, consumer headphones, and other applications. It features a custom-designed eight-microphone array precisely positioned for accurate near-field and far-field voice pickup. The Bose Home Speaker 500 has the widest soundstage of any smart speaker available today. It's wrapped in seamless anodized aluminum, is a mere 8" high x 6" wide x 4" deep, and uses two custom drivers pointed in opposite directions - so sound reflects off surrounding walls, separating instruments to the far left and right, and placing vocals where the artist did. The result is powerful and lifelike - without artificial effects or distortion. And when touch control is preferred, or the phone is out of reach, there are buttons for basic functionality located right on top. The Bose Home Speaker 500 will retail for $399.95 and sold at Bose retail stores, Bose.com, and from authorized Bose dealers, available beginning this October.